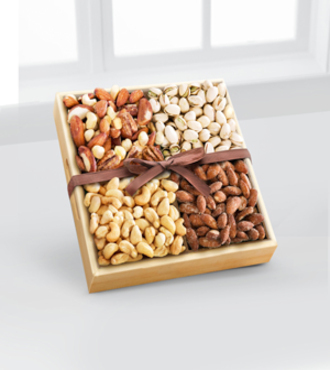 The Kosher Assorted Nuts Tray is the perfect gift for any occasion! Presented in a natural wooden tray with carved handles and tied with brown satin ribbon are a collection of almonds, roasted salted pistachios, smoke house almonds, and roasted salted cashews. A gift sure to be appreciated by friends and family. 1 lb, 4 oz. Every item is certified kosher by a leading kosher certifier. Gift is clearly marked with certification.